We send greetings to you and your family as you observe Easter this year. During this joyful season of new life and renewal, we celebrate the central event of our faith -- the Resurrection of Jesus Christ. The message of Easter is the message of the Risen Lord, of his triumph over sin and death. It is a permanent message of hope for Christians and for humankind. On the third day God raised him to life.. We are his witnesses. It is to him that all Prophets bear this witness' (cf Acts 10: 40-43). Christ is risen. Indeed he is risen. Let us rejoice and praise the Lord of glory. - Dying For A Lie!? - Mordan Be Khatere Yek Dorouq !? This card was created by FarsiNet Team ( webmaster@farsinet.com) especially for FarsiNet Friends & Prayer Partners. 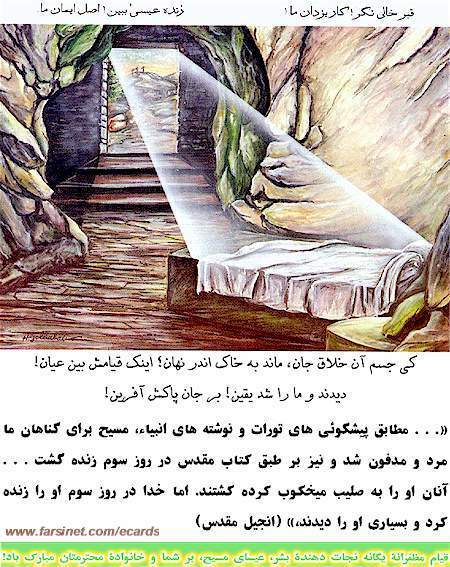 If you would like to send Easter card to family and friends, just go to FarsiNet eCards and create your own FREE Easter Musical Persian eCard.